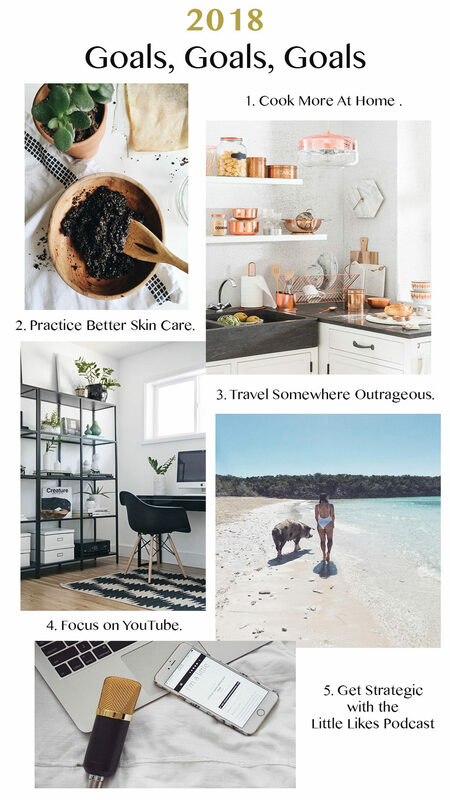 Fast Five: 2018 Goals | ya, we're basic. So if you recall, I wrote a little letter to myself as a way to combat the anxiety I felt around the new year and not really knowing where I want to go. That my friends, is a lot of bite off and frankly right now it is more than I am ready to chew. So I gave myself a time out, but I also know I’m a psycho and I need to put my energy in to something which is why I did put together a quick list of goals that are a little lighter and brighter. I’m hoping these goals will allow me to practice self-care, focus more of areas of my life I want to improve in and create a sense of accomplishment that has been lacking for the last little while. So here are my Fast Five: 2018 Goals. I’d LOVE to know your thoughts on the below; whether it’s advice, positive reinforcement or something you’d like to see more of on the blog in 2018. 1. Cook More at Home. Health-wise, 2017 was the year that started out strong (continuing a positive streak from 2016) but it ended real rough. My mental health took a turn and my eating habits and exercise regime fell way off. And then I got the flu and let’s just say everything endorphin-related completely flatlined. The past month has been blatantly disgusting but I am not getting down on myself. I’m already back to eating right and working out, so really this goal is an effort to take more joy in my healthy lifestyle by focusing on finding fun, flavorful recipes that still satisfy my waistline. By the end of last year I fell victim to the UberEats black hole (i.e. stopped buying groceries and ordered all my meals) and I’m done wasting money, wasting calories and essentially feeling like crap because I don’t know what’s going in my body. 2. Practice Better Skin Care. I basically became obsessed with skin care in 2017. I think I did a pretty good job of getting a handle on what worked for me and what didn’t, though I am still experiencing issues with hormonal breakouts. This year I really want to focus on how the food I eat and the vitamins I take affect my skin care. I want to build off of the best practices I put in to place last year and continue to understand my skin and my body. This is also something that you expressed a ton of interest in (via Instagram Stories) so I am really looking forward to learning together and reviewing new products or dietary routines and sharing with you. I did a lot of traveling in 2017, especially at the beginning of the year. It was amazing and made my heart happy to live so many new experiences – swimming with the pigs in Exuma, hiking in St. Barth’s, combating jetlag for a weekend in London to visit my bestie. I had a couple trips later in the year that I had to forego and it broke my heart, so I really want to plan my time this year and visit somewhere I can’t even imagine going. Whether it’s Hong Kong, Australia or a U.S. town that’s close but brand new to me, I really want to wow myself and make it somewhere I’ve never been or never imagined I’d go. In my 2018 resolution readings, I happened to check out Erin’s of Style By the People here. She said one of her lessons was to Travel More, Always, and this is something I’ll really be taking to heart as 2018 travel plans are underway. I completed a few YouTube videos in 2017 but I am in complete awe of beauty vloggers and just how amazing their video quality can be. As mentioned above, Beauty is an area of interest for me and you here at i’m a little, and the only way I’m going to bring my A game is by diving in to this new platform. To be honest, my hesitation with YouTube comes from the fact that I know very little about editing and am afraid that my content won’t be as strong as the bloggers/vloggers I aspire to be like. I cannot tell you why I am so intimidated by YouTube but with any other platform or opportunity the only way I approached it was to start and figure it out, so that is what I’m going to do. I purchased a ring light and new camera to hit the ground running and I’m pretty pumped to embarked on this journey with a new focus and challenge to face. 5. Get Strategic with the Little Likes Podcast. This is one situation where I jumped in to a new platform and am still figuring it out. Like YouTube, my desire to start the podcast was because I was genuinely interested in the other podcasts I was listening to and really wanted to try it out for myself. I love the platform, I love talking and I love answering my listener questions. But like any good thing, there comes a time when you need to review and revise and that’s where I am now. I want to build a more structured podcast – create more value (whether that’s more interviews or answering more questions) and I want to have a concrete format that works for the podcast where my listeners will know what to expect when they’re downloading each week. You really enjoy my reality TV recaps, but I don’t want the podcast to be strictly reality, so I need to take a step back and determine how we can make it work. Perhaps there are mini episodes or I split subjects/segments to two podcasts a week. I’m still not sure. But the point is, I want to make it priority so that I can continue to put out fun and interesting content that you want to keep listening to. Stay tuned for more on this! So those are my 2018 goals. I think they’re solid and actionable but most importantly I am excited about them. Some of them are intimidating but I am up for the challenge and looking forward to seeing how I improve as a result. What are your 2018 goals that you’ve set out for yourself? I hear you on the fitness goal! I signed up for a Spartan race with hubby and this time around we will make sure we train (epic fail last time lol). Also found out that I am dairy and egg intolerant which is forcing me to be a label reader (not a bad thing, I guess) so those are my foci this year (for the most part) eat better and give my body the respect it deserves by strengthening it. You are an INSPIRATION Alex! I enjoy your blog (especially the self reflection and goal planning blogs – they are encouraging). I think I need to pay more attention to your beauty and fashion posts lol (I am too much of a tomboy lol). Lots of loves and encouragement!